This is a 4-night, 5-day photo workshop. The workshop begins at 11 a.m. on August 18 and ends at 4 p.m. on August 22 after the final slide show. $1,500 + applicable taxes. Register below. As with all National Parks at Night Passport Series workshops, we will teach at this location only once. 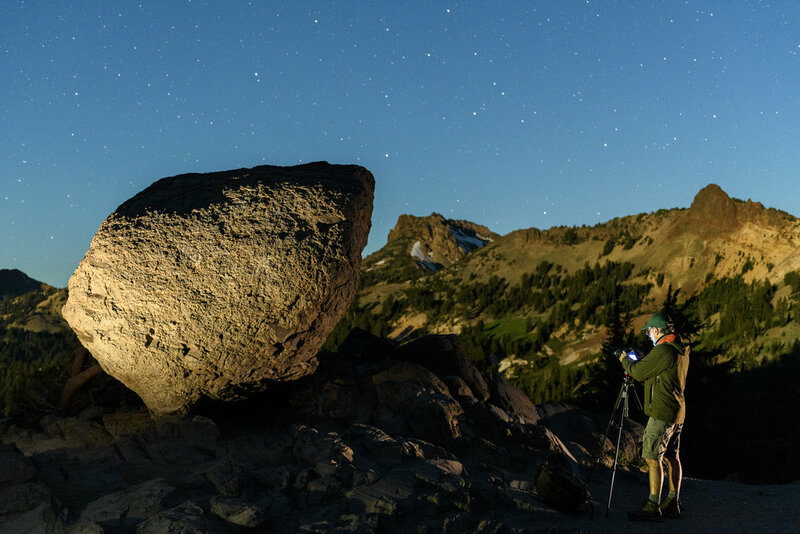 If you have a dream of making epic long exposures at night at Lassen Volcanic National Park, we hope you join us. 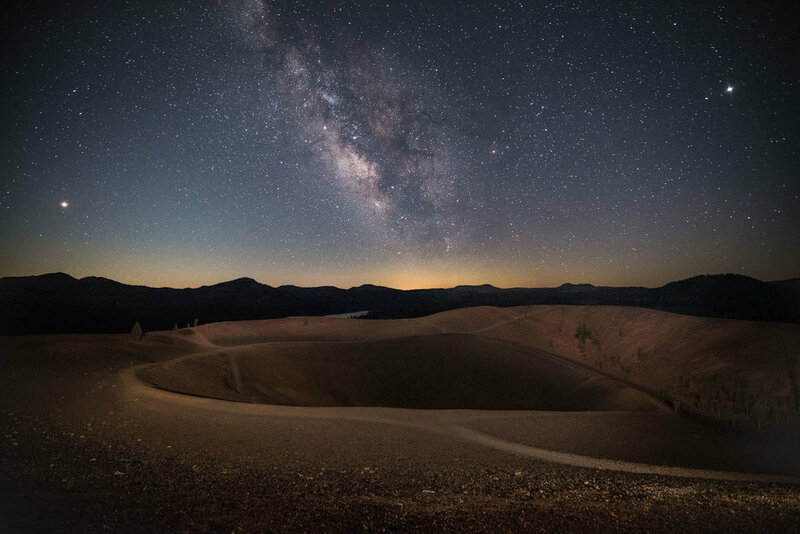 For those who want a special challenge after the workshop, we’re offering a two-night hiking and camping excursion to Cinder Cone. This optional remote-area add-on begins at 3 p.m. on August 23, and ends when we break camp on the morning of August 25. $700 + applicable taxes. A space in the group campsite is included in the add-on fee. After registering for the main workshop, you will receive a link to optionally register for this post-workshop hike. First come, first-served. Balance of $1,000 due on May 20, 2019. Last day for a cancellation request is May 19 (see cancellation and refund policy). This workshop is structured a little differently than most of our other Passport Series workshops. Aside from a night photography primer on the first day, there won’t be any formal classroom lectures or group image reviews. Instead, each participant will have scheduled appointments to meet individually with the instructors to focus on specific goals and needs, as well as time with the instructors during open processing labs each day, and in the field each night. We want this experience to be cathartic and transformative for attendees, and feel that the intimacy of a boutique hotel—where we are the only guests—provides a way to connect with you on a deeper individual basis. We will help you to set achievable goals for the week, and will check in with you on a daily basis as you work toward them. What kind of goals, you ask? See the “What You Will Learn” section below, and use that as a starting point. With individual attention, we can come up with an action plan to work on a specific aspect of your photography, regardless of whether it is technical or aesthetic in nature. Maybe you just want to make better images. Lance and Gabe will work with you to figure out the best approach to do just that. Lassen is a special place. Think mountains, lakes, old-growth conifer trees, alpine meadows, and hydrothermal areas with steam vents and boiling mud pots. It’s not as dramatic as Yellowstone, nor as immense. It’s more intimate. Imagine the High Sierra of Yosemite, with less than 10 percent of the people. The air is clean, the water pure, and you’ll be surrounded by nature on a scale that is impressive, gorgeous and approachable. 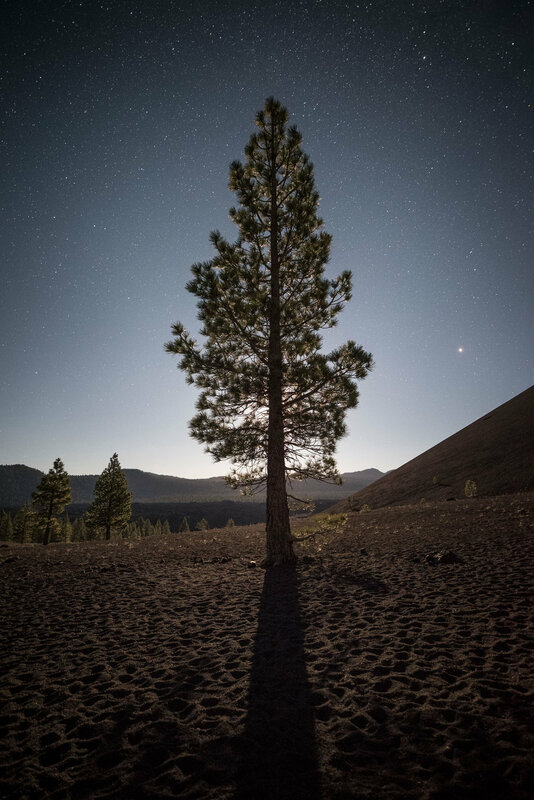 One of the best parts of Lassen Volcanic National Park is the Cinder Cone and the surrounding environment. It’s in the northeast corner of the park, far from accommodations and from, well, just about everything. 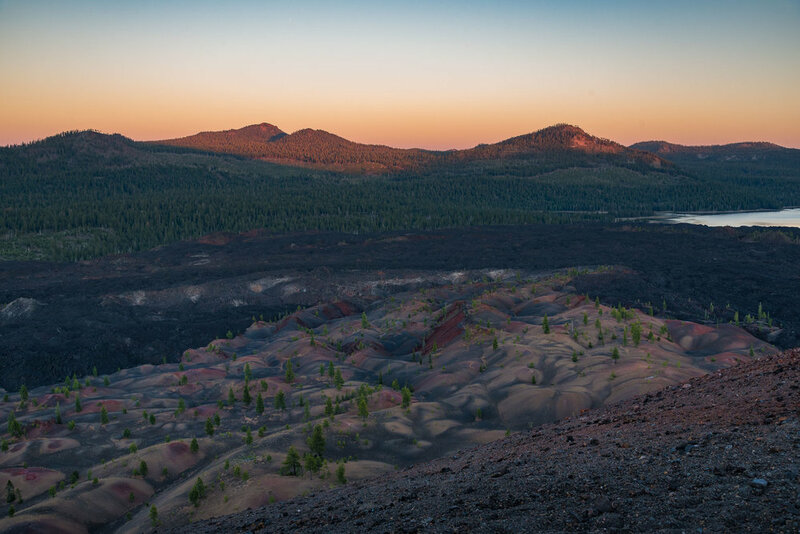 To get the most out of a visit to Cinder Cone you have to climb it, and that’s not for everyone. Still, we couldn’t do a workshop at Lassen without visiting this great spot, so we are offering this location as an optional two-night remote-area add-on to the workshop. After checking out of the Bidwell House at the end of the workshop, those who elect to do the add-on adventure will drive to this remote corner of the park where we will camp, explore and photograph the area around Butte Lake, Bathtub Lake and Cinder Cone. We will be in a developed campground in the national park, but it is at a remote location without showers and we must bring our own tents, sleeping bags and food. You may spend the night of August 22 at the Bidwell, other hotel or camping. There are no planned activities for the night of August 22. You can rest up one more night at the hotel, revisit your favorite location from the workshop, or stock up on provisions and get ready for camping. Whatever you choose, your campsite in the Cinder Cone area must be set up by the time the add-on begins. Plan to arrive at the campground by 2 or 3 p.m. on August 23 to set up and get situated, and our adventure will begin at 6. Sign up for this special add-on experience if the idea of climbing an (inactive) volcano with 25 pounds of camera gear doesn’t faze you. However, if that sounds like a really bad idea, it probably is and you should stick to the main workshop. Participants must have at least basic photo skills, know their cameras well, and be comfortable shooting RAW in manual mode with a DSLR or mirrorless camera. Night photography experience is not necessary, but even folks with extensive experience shooting at night will find this class challenging, stimulating and inspiring. For more advanced night photographers, we will offer guidance in the field if you mainly want to concentrate on creating portfolio images or learning more advanced techniques. Because of the individual instruction offered in this workshop, we will be able to work with you on exactly what you want or need. Perhaps you have trouble focusing at night? Do you need a better understanding of hyperfocal focusing? Have you always wanted to learn how to use PhotoPills? Need to work on your light painting skills? 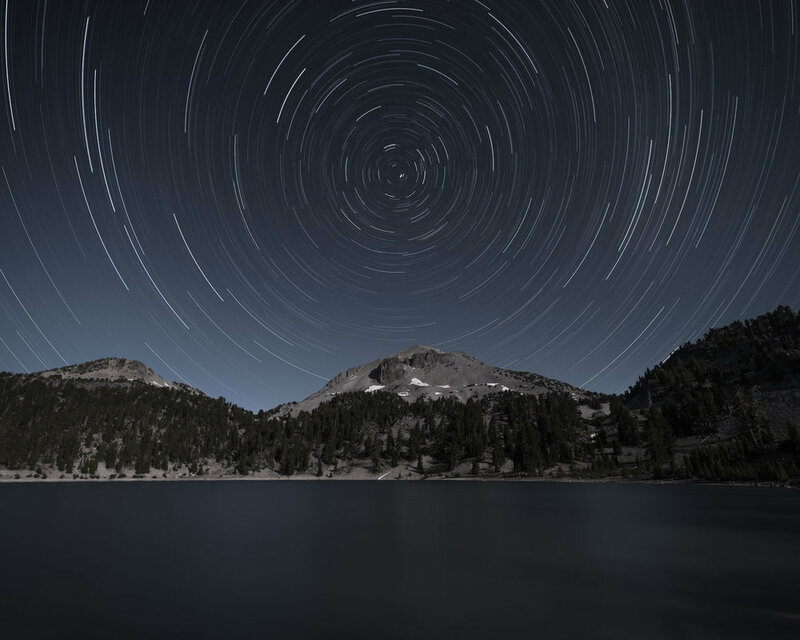 Image stacking for long star trails, or panoramas. 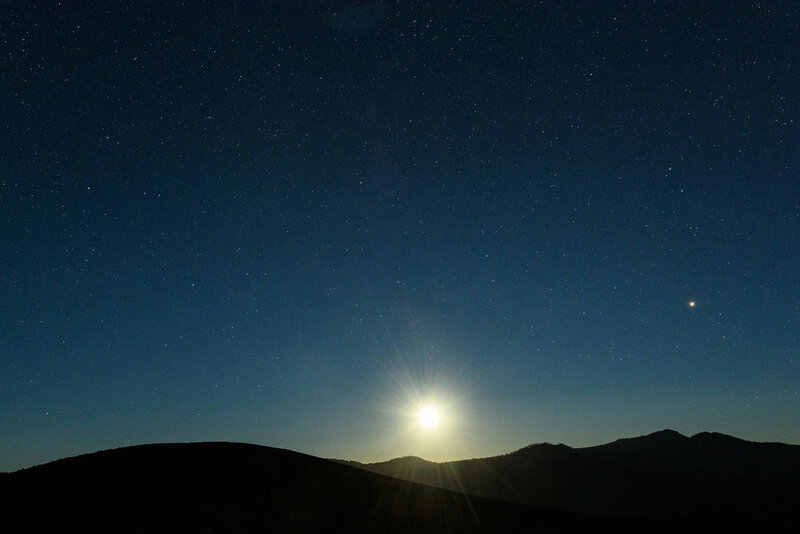 Maybe this is your first time shooting at night, and you just need the basics. It’s up to you—this is your workshop. We have found that our participants benefit greatly from working through a photograph with us, from concept to completion. If and when the instructors bring out their own cameras, it will be as part of the instruction. We always put our students first before making our own images. We do not tell our students what to photograph, and won’t line you up in a row to all shoot the same thing. Instead, we encourage you to use what you have learned to create your own unique images, and to let us guide you through the process should you desire. We do not teach you to do what we do, but rather how to develop your own night vision. You are responsible for your airfare and car rental. (There is no need for four-wheel-drive or high-clearance vehicles.) If you are interested in sharing a car rental, let us know and we will try to connect you with someone like-minded in the group. The workshop will be based at Bidwell House Bed and Breakfast Inn. We have reserved the entire hotel for our workshop, and all participants will stay there. You do not have to do anything to reserve a room until the hotel reopens in the spring. We will send you a reminder in April to call them and choose which room you would like, and to provide your credit your credit card details to them at that time. Plan to check in on August 17 or earlier, and to check out on August 22. Lassen is remote. Our hotel and meals are 30 to 60 minutes from where we will be photographing. We will usually make lunch our main meal and take food with us into the park for a picnic supper. We recommend bringing a water bottle or CamelBak and a small collapsible cooler. Once we leave the hotel in the afternoon, we will not return until late at night after the field session. You are responsible for arranging and paying for your own meals and accommodations. Summer in the mountains of interior Northern California means hot, dry days with temperatures in the 80s to 90s, and cool nights with temperatures ranging from the 50s to low 70s. Recommended attire: There’s little chance of rain, although a thunderstorm is possible. Bring layers, including a windbreaker and fleece or sweatshirt. You will want a hat and sunscreen for protection from the sun, and bug spray. Open-toe shoes are fine most of the time. For the optional add-on at Cinder Cone, be prepared for windy conditions and bring lightweight hiking boots for hiking on sand. No vigorous activity will be required during the workshop, but please consider your physical abilities in hot weather prior to registering. There won’t be any long hikes, but you should be comfortable carrying your own equipment over uneven ground in the dark. 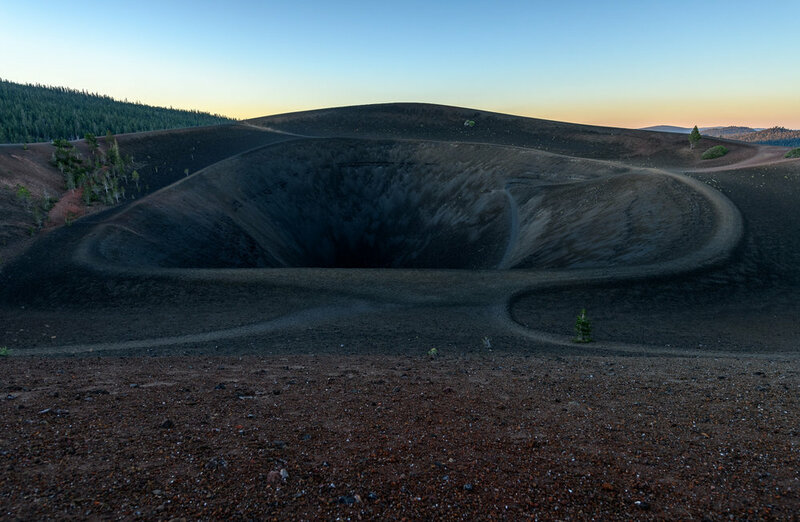 The add-on experience requires walking the sandy 1.6-mile trail to get to the base of the Cinder Cone, and then climbing approximately 700 feet (60 flights of stairs) on loose pumice to get to the top––with your gear. You must be healthy and physically fit in order to take the add-on adventure. It’s approximately 1.5 to 2 hours to get from the campground to the top of Cinder Cone, and 1 to 1.5 hours back. If you register for the add-on and are not able to climb to the top, you can still enjoy the camping experience and the lakes, as well as the dunes and lava fields around the cone, but both instructors will be leading the group around the base of the cone the first night, and both will be climbing the Cinder Cone the second night. Note: To ensure the safety of individuals and the group, National Parks at Night reserves the right for workshop leaders to use their discretion to limit an attendee from engaging in a rigorous activity on-site should that person's physical health or ability be in question. If you are unsure about your ability to meet the physical demands of this workshop, we will be happy to discuss your concerns one-on-one before you register. You are also, of course, welcome to attend a workshop and sit out any physical activity that makes you uncomfortable. I’ve spent more time in California’s national parks than in all of the other parks combined, but I’d never been to the northeastern corner of the state. I first came to Lassen by default. Chris and I had just finished our workshop in Redwood National and State Parks. 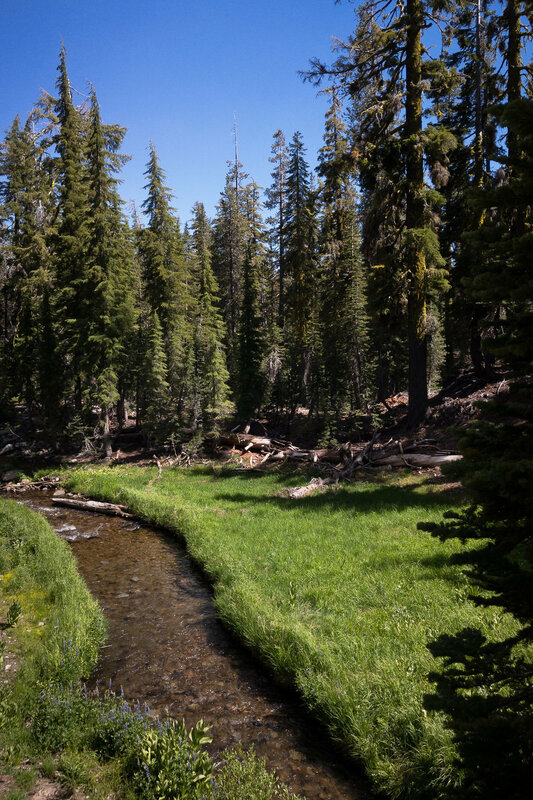 Lassen was on Chris’ bucket list, and I needed to scout a new park for a 2019 workshop. We had a few days, and were relatively close, (a five-hour drive away) so we left the coast and drove along the Trinity River and into the mountains that make up the southern end of the Cascade range. After an incendiary Thai dinner in Redding we continued on to the park, arriving well after dark. We were just in time to catch the moonrise over Reflection Lake. 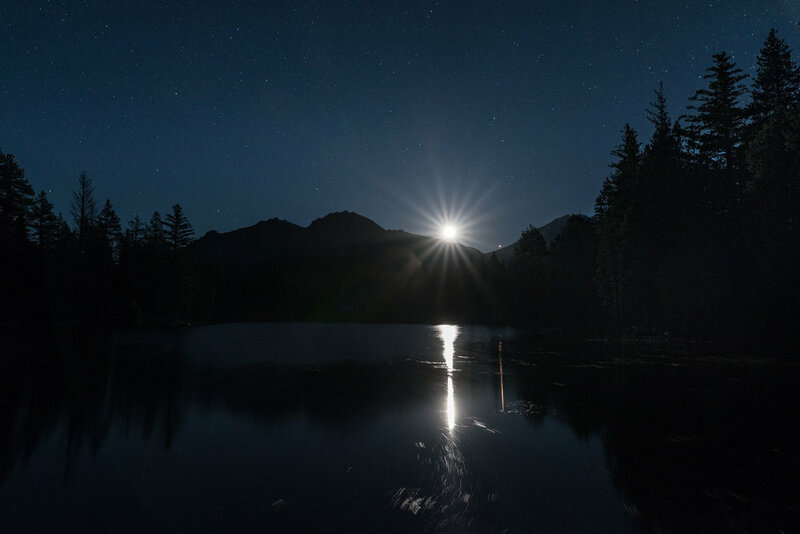 The sky began to brighten from black to a deep royal blue, and true to its name, the lake reflected Venus, a few bright stars and eventually the moon as it rose above the water with Lassen Peak in between. It was a glorious site. But what captured and held my attention was the smell! The soft, warm mix of butterscotch and vanilla told me that we were surrounded by Jeffrey pines! I knew and loved that smell from the time I’ve spent exploring the Eastern Sierra. Jeffries have a distinctive pattern to their orangish bark, but that was now obscured by the darkness. I asked Chris if he smelled butterscotch or vanilla, and he chose the latter. The Jeffries further south are mostly second-growth, because Bodie and so many other towns in California and Nevada were built from the fragrant wood of the Jeffrey pine. 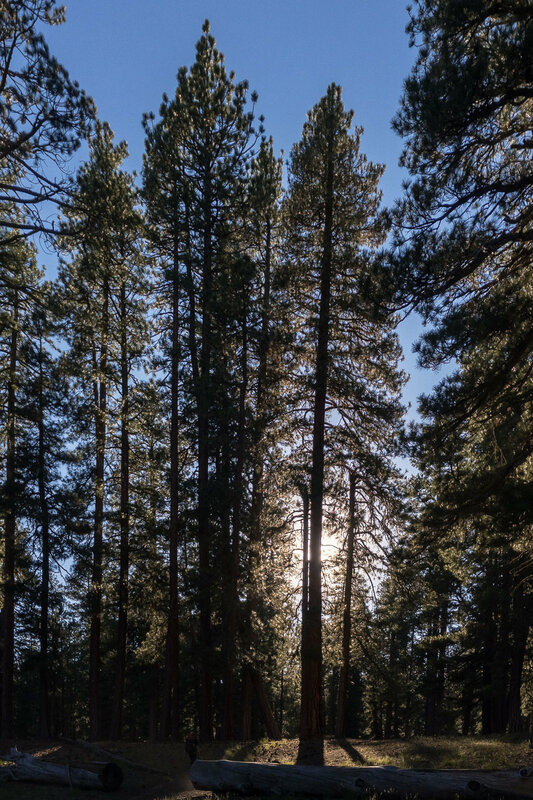 As we would discover over the next several days, the trees in Lassen are enormous––old-growth giants that, while nowhere near the size of the redwoods we had just left, were still impressive. It was easy to see how early settlers must have been thrilled to find such a ready source of lumber to fulfill their needs. Luckily though, the trees in Lassen were spared that fate, and like the small percentage of remaining coast redwoods preserved in that other arboreal park, these trees were here to welcome us as we explored this hidden gem of a park in Northern California.